In this post, we’re going to take a look at the 44 Remington Magnum caliber as a prepper choice. What are the pluses and minuses of the 44 Magnum? Which preppers could benefit from this caliber? The 44 Magnum was originally developed as a hot-loaded 44 Special by Elmer Keith. By modern standards, it’s not as powerful as many handgun calibers out there. For those of us who grew up way back when, it was the most commonly available powerful handgun caliber. It’s used by big game handgun hunters. It’s carried as a sidearm by many guides in bear country. One famous prepper says he carries a 45 ACP for protection against bears. In my opinion, that’s not a great choice. Even the 45 ACP 230 grain FMJ bullets only penetrate about 4″ to 5″ of pine boards. The 44 Magnum can easily penetrate double that. If something big and mean is charging you, the most important thing is that your bullets can penetrate adequately to reach vital organs. They might need to get through heavy bone. If you bug out to Alaska or hunt big game with a handgun, the 44 Magnum is a round to consider. The 44 Magnum has impressive ballistics for a handgun. Double action 44 Magnum revolvers are rather large and aren’t the best choice for shooters with small hands. But a small handed shooter can shoot them successfully with two hands. The Smith & Wesson Model 29 N Frame comes in a 4″ barrel length and a 6″ barrel length. For defensive carry, the shorter barrel is best. For hunting and more accurate shooting the longer barrel is better. Barrels longer than this are just too long in my opinion. When hunting aim to fire it single action for enhanced accuracy. For shooters who want to go really-old-school, you can purchase single action revolvers in 44 Magnum. Many shooters shoot these with one hand and just let the gun ride up under the powerful recoil. You can even find lever action carbines in the 44 Magnum. While not as powerful as a 30-06, a 44 Magnum from a carbine barrel can easily kill anything in North America within 100 to 150 yards. In wooded areas, it’s really all you’d ever need for big game. In terms of effectiveness it’s considered about comparable to the 30-30. One bit of advice I’ve heard over the years is that shooters who like revolvers for defense and who like the 45 ACP caliber should purchase a revolver in that caliber. I’ve never really liked the 45 ACP in revolvers. To me, it just seems out of place. It’s a round designed for autoloaders. If you have big hands and want a big bore revolver for personal defense, the 44 Magnum with a 4″ barrel is a great choice. What about the heavy recoil of the 44 Magnum? Isn’t this a problem for defense? For personal defense and for practice, you don’t need to shoot full power ammo. Heck, I own a 44 Magnum revolver and don’t have nary a box of the full power stuff anymore. The most powerful ammo I use is the mid-velocity ammo. It fires a 240 grain bullet at about 1,000 feet per second. Yes, I’m a wimp. Because the 44 Magnum is an elongated 44 Special, you can fire 44 Special ammo in your 44 Magnum revolvers. It’s similar to using 38 Special ammo in a 357 magnum. If you do this, be sure to clean up any build up in the cylinders which could cause the longer shells to stick or could lead to corrosion in the area. Loaded with 44 Special ammo, a 44 Magnum is a pussycat to shoot. With the right ammo, you can essentially match the ballistics performance of the 45 ACP, if that’s your goal. The 44 Magnum is popular with reloaders. In the prepper classic The Road Warrior, a 44 Magnum made a cameo when Lord Humungus used it to try to stop a truck by shooting holes in the radiator. I don’t think things will ever get so bad that we’ll have a long term breakdown of society, but if we did, the 44 Magnum caliber has an advantage. Humungus only had three or four cartridges. With a bit of ingenuity, he could have had more. Being a big bore, the 44 Magnum can be effective with black powder and cast lead bullets. Some cowboy shooters use black powder. Modern smokeless powder is superior. But you can make black powder yourself if you run out of the good stuff. Making black powder was written about in the Firefox books. Important Note: I’m not sure about the legality of making your own black powder today. Because of safety issues, there are laws restricting how much black powder you can store. Even easier than making your own black powder is casting your own lead bullets. Obviously, be careful when you mess with molten metal. You could even try to make your own primers from aluminum pop cans, but everything I’ve heard about this venture is that it’s a flop. According to several shooters, there are legal limits to how many primers you can store. If you had a lot of brass cases, bullet molding equipment, knew how to make black powder, and stored a bunch of primers, you could keep your 44 Magnum going when the rest of us would be throwing bolos and shooting arrows. If you’re interested in taking up bullet casting and reloading and like revolvers another great caliber is the 357 magnum. We’ll look at it in a future blog post. Who Should You Trust For Prepping Advice? Demcad has a great post about shopping for guns and the advice you’ll receive at gunshops. 1) Is the person speaking an expert or even knowledgeable? Do they have “real world” experience? Listening to somebody who doesn’t know what they’re talking about makes no sense and is a waste of your time. This is why the more you know the better… you have a better BS detector. All of us will have some errors in our knowledge and we’ll only know so much. But that little bit will help us weed out the real hacks when we seek further advice. Metaphorically speaking, aim to be your own second best mechanic in the world. Better: “Get a second expert unbiased opinion from somebody you know and trust.” Be especially careful of the random “opinions” of those who you don’t know on the internet. There is whole army of people posting false propaganda, fake reviews, and other BS on the internet. This applies to reviews of TVs and to analysis of political positions. This article shows Russians are hired by their government just to sit around all day and make comments online. Wasn’t that a job description in Brave New World? The good thing about being your own expert is that you’ll have your own best interests at heart. You’re not just trying to sell yourself a new set of expensive brake pads or manipulate yourself into voting a certain way. 3) Is the expert willing to take the time to explain what you need to know and do they understand your position? This is easily overlooked. What works for one person might not work for another. The best example I can think of is professional fighters teaching self defense. Yes, pro fighters know a lot about fighting. Too often, though, they teach techniques that take too much training for the average person. Too often, they teach techniques that require substantial power or physical skill. Budget is another consideration. Somebody can recommend a tricked out 1911 for defense, but if you’re budget is $500, the advice isn’t useful to you. Whenever you seek advice, ask yourself: 1) Is the person knowledgeable? 2) Are they biased? And 3) Do they understand my situation? 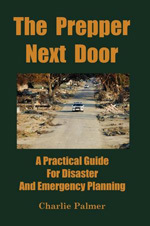 Get insight from other experienced preppers, but ultimately remember, you’re your own best expert. Here’s a solid post about disaster preparation basics. What are your three favorite or most important prepping supplies you’ve purchased? Here’s a good open discussion about what you should keep in your vehicle. Parts of China are beset by heavy smog. Pollution levels are over three times hazardous and over 50 times what is deemed a safe daily level. Some of this smog is affecting things as far away as Japan. If there are any Chinese or Japanese preppers reading this of financial means, look at the IQAir line of air purifiers for your home. The IQAir HealthPro Air Purifier is rated down to 0.003 microns. These are the crème-de-la-crème. For poorer preppers and cheapskates, another choice is the Honeywell 50250 air purifier. These run about $160 on Amazon. I have two of these and they seem well made. It’s estimated exposure to Chinese-level pollution takes five years away from longevity. If pollution levels were extremely high or you were ever faced with a situation where toxins were in the air, the best solution is to use a powerful fan bringing in filtered air into your safe rooms. The fan should be powerful enough to create a positive pressure difference between the outside air and the air inside your room(s). This pressure difference helps prevent particles from entering your room through the tiny openings that are common to all homes, regardless of how well we seal off a room with plastic sheeting and other means. Over at Apartment Prepper there is new series “Self Sufficient Saturdays” which discusses topics like how to cook beans or brew coffee without electricity. These are great hands-on-posts showing preppers how to do things. Many people new to weightlifting wonder “How much should I be able to …?” Bench press, squat, deadlift, etc. It doesn’t really matter. Each individual should only be concerned with personal improvement, not what others do. If you’re making personal improvement, you’re doing great! For those who must know, this site has some neat charts. If you’re a member of Congress, don’t sweat it. You’ll be able to use your political slush fund to pay $6,230 to a personal trainer. The TV show 60 Minutes exposed how these slush funds allow members of Congress to get payments from lobbyists and special interests and then use the money to fund lavish lifestyles. The politician said “using campaign money for a fitness instructor is a legitimate expense because gym visits alleviate stress…” Too bad nothing alleviates our stress of having our country led by these @&#$*$#! You can purchase it at Amazon.com. The other day I made a pull up bar from some spare pipe I had. Nothing complex. I cut it to size and held it in place by some 2x4s. It sits over an opening in a stairway. Before inspecting some old heavy pipe I had, I priced some new metal pipe. It was shocking to see how much new thick metal pipe costs today! Even though I had stored this pipe outside, it was in surprisingly good shape and very usable for the project. Other pipes were corroded and pitted. I had taken this pipe for granted. Looking at today’s prices, the cost to replace all the scrap pipe with new would be in the several hundreds of dollars. Preppers should consider the future availability and cost of stockable consumables and raw materials they use. Just because something is cheap and available now doesn’t mean it will be in the future. When you can afford it, it’s not a bad idea to stock up. Other examples come to mind. On gunbroker.com I saw a mint condition Colt 1911 Series 70 Gold Cup with a buy now price of $1,800. In the 1970s, you could get these for around $300. Just because you can afford something now doesn’t mean you’ll be able to in the future! The recent rise in 22 LR ammo prices is another example. I have 50 caliber ammo cans packed with 22s from years ago. Much of it was purchased for $1 for a box of 50 or $10 for a brick of 500. If I was younger and still shot a lot, I could shoot for a while before running low. Younger shooters without a stockpile would need to pay through the nose or reduce their shooting. My advice: Purchase a quality air rifle and air pistol. At the lower end, The Beeman P3 air pistol shoots well. Quality American made tools are a final example. If I could go back in time, like in Back To The Future or something, I’d come back with a cartload of tools that are no longer made here. You can get good quality, it’s just that you’ll pay through the nose for it. For preppers who are handy do-it-yourselfers, work to assemble a complete set of tools and a small stash of raw materials. What things do you wish you had purchased and stocked up on in the past?